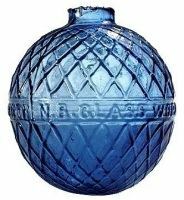 In addition to the Ink, Gauge glass and laboratory product ranges John Moncrieff’s North British Glassworks produced a huge variety of other products in their long history. 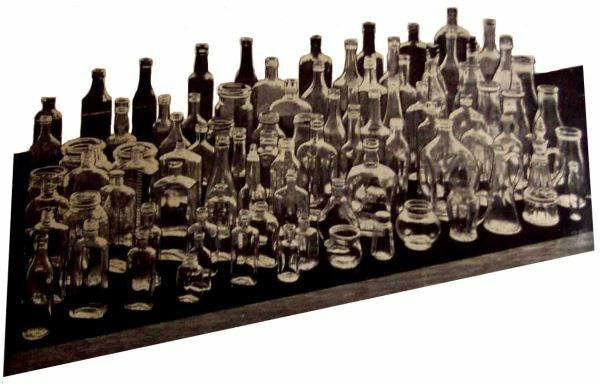 The most poorly documented are the bottles that they produced and developed innovative machinery for. These were made in different colours and filled with feathers. They must have left a lot of glass fragments behind after use! “N.B. Glass Works, Perth” is moulded around the middle band. 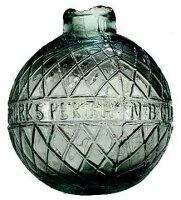 They were used from about 1870 to 1900 when clay pigeons were invented. Colours known are Yellowish clear, Aqua, Green shades, Light Blue and Cobalt blue. Any others colours? 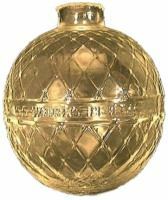 They are found with flat and rounded bases. 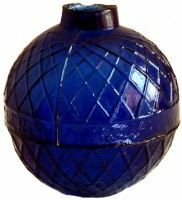 While it was known that Moncrieff made bottles it is almost impossible to obtain a certain attribution at this stage, particularly for hand blown bottles. Machine made bottles probably had some mould marks on the underside. 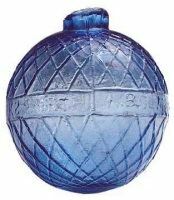 All Moncrieff bottle production was made at the Tayside works, not far from where the Ysart’s built Vasart’s Shore Road Works. 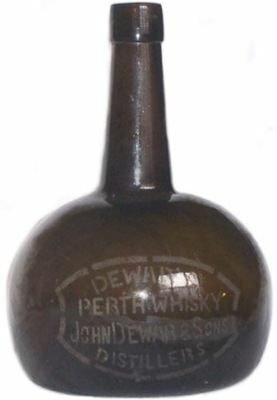 This Dewars ‘Onion’ whisky bottle is a possible Moncrieff product, it was made around 1880, although as John Moncrieff was involved in the Temperance movement, it is possible that he did not accept orders for alcohol containers. These are rare and fetch € 150+. Any other examples? Swans made at Moncrieff’s originated from a style and technique developed by Bernard Wade, the melting dept. foreman, (formerly of Wood Brothers, Barnsley). After 1960. A gather of glass is dropped onto a piece of insulation brick, and using single pointed tweezers the beak and eyes are formed, the neck is then drawn upwards and bent to shape. After this has cooled sufficiently to retain its shape, a second gather is dropped directly onto the first and the tail is drawn up, followed by the wings which would have 2 or 3 indents on them. This produced a highly stylised figure with exaggerated tail and wings. Nearly everyone made, or attempted to make swans and they all copied this technique, but they all ‘looked’ different. Bernard always made these in sets of three: small approx 3", medium 4", and large 5 ½" and the bases were ground and polished. The clear ones were all made in Monax (because it was easier). But on the rare occasions that a colour was melted, coloured swans appeared; if any of these are found they are extremely rare. There is one exception to the above. 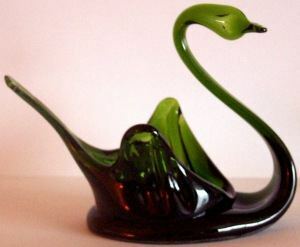 A glassblower (ex Waterford) had made swans in Ireland (What is it about swans?} but used a different method to form the wings. An engineering apprentice of mine engraved a pair of borsella puntatas and he used these when he made his swans but they were not very popular and he concentrated on making fish. These ‘Irish’ swans never had circular bases, and they show a colour tint; Monax had a yellowish tint, and MS1 glass had a greenish tint. There were no handouts to school visits or anyone else; it is however highly probable that some of the ‘sets of three’ suffered casualties and the survivors were given to anyone interested in them. This swan was made for this site by an ex-Moncrieff glassmaker, a colleague of Colin Mayor, using Bernard’s technique, but the wingtips were normally higher.